Mechanics of Composite Materials contains the proceedings of the Fifth Symposium on Naval Structural Mechanics held in Philadelphia, Pennsylvania, on May 8-10, 1967. The papers explore the mechanics of composite materials for naval applications. The structural requirements of a system and the fundamental mechanical properties of composite materials, as well as the behavior of such materials under various environmental conditions, are discussed. 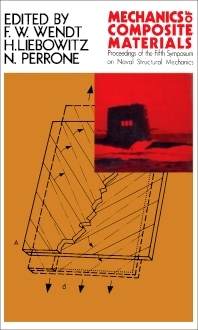 This book is comprised of 40 chapters and begins with an analysis of missile and aircraft systems constraints and operational requirements, along with ship systems constraints and operational requirements, for composite materials. The following chapters focus on structural uses of composites, particularly in naval ships, aircraft, re-entry vehicles, and space vehicle structures; and the micromechanics, structural mechanics, and failure mechanics of composite materials. Problems in the design of joints and attachments are considered, along with the stability of pre-strained laminated media; environmental factors in the design of composite materials; and the effect of water on glass-reinforced plastics. This monograph will be a useful resource for scientists and engineers who are particularly concerned with the mechanics of composite materials.